Two weeks ago, we hosted a Study Tour group from Norway. Six students aged between 13 and 15 from the Kjølnes Ungdomsskole (a secondary school) in Porsgrunn came with two older students aged 18 and two adults, Michel Fouler from "På sykkel i Telemark" who organised the tour and Bent Gundersen who is one of the teachers. All are from the Telemark county in Norway. allowed experiences to be shared. Due to the efforts of cyclists in the area including Michel's cycle training organisation, Alle Barn Sykler, and an enthusiastic cycling headmaster, 60% of students cycle regularly to the Kjølnes Ungdomsskole. However, the same is not true of Norway in general. Cycling amongst teenagers has declined sharply in Norway. While 15% of those aged between 13 and 17 cycled on a daily basis in 2005, by 2009 this figure had shrunk to 9%. This is one of the reasons why there was interest in comparing the conditions in which Norwegian and Dutch children and teenagers cycle, because how pleasant the conditions are for cycling certainly affects how much people will cycle. Work on a presentation started even during the journey home. On Friday 23rd of March, a week after returning home, the students travelled to Oslo to a workshop with the Road Transportation Department in Norway, connected with planning for the Norwegian Bicycle Masterplan for 2014-2023. Tobias and Chatrine, two of the 15 year old students, made a presentation based on what they had seen in Assen and Groningen on the Study Tour. This was a wonderful group to host. The confident and intelligent manner of the teenagers outshone their ages. They were genuinely interested in the issues and they asked sensible questions. It was interesting to see how confidence on the bikes grew over just three days in the Netherlands. At first the group was reluctant to cycle two abreast due to concerns about taking up too much space. This concern passed quickly. In its place came the Dutch, confident and sociable way of riding next to a friend and talking at the same time. Similarly, on the first day, all the students wore helmets. By the third day, no-one could find one. We'd never presume to tell anyone what to wear when cycling, and that goes double for other peoples' children. However, by the end of three days there had been a revolution. This is subjective safety at work. People reacting to the conditions. 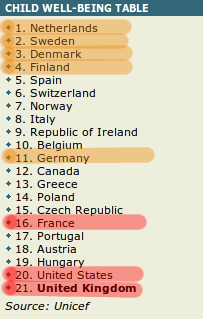 It was mentioned to us that Norwegians were not entirely happy about being in 7th place in the index of child well-being from UNICEF (is your country in the list ?). As I've noted before, the top four nations in this survey are the top four cycling nations in Europe. The connection with cycling should not be surprising. Dutch children and teenagers see cycling as freedom. Even though we live in a rural area and the distance that some have to travel to get to their chosen school can be long, there are no school buses here. We were told by in our school meeting in Assen that one of their students currently rides more than 60 km as a round trip each day to get to school and back home. This is interrupted only for a brief period mid-winter when her parents object to her riding the entire way in darkness. Why prefer cycling ? Because otherwise she'd miss out on the social aspect of riding with other students. While they were here, the Norwegian teenagers experienced some of the freedom that Dutch teenagers find to be normal. This freedom comes because of the safe cycling conditions and the safe cycling conditions are due to the infrastructure. Our Norwegians visitors were passionate about what they saw, and wanted to take this back with them. We hear that the presentation and film have had quite an effect and hope that Norway's planners and politicians will listen to their youngsters. Children and teenagers need freedom. Instead of designing around adults in cars, planners must design around the needs of children. Children must be seen as the rightful heirs of our future transport network. We still have places on the public study tour in May, and can organise tours on most dates to suit groups. Contact us to make a booking. We would be very pleased to meet with an official group from Norway this year. We can show you exactly what the students saw. Please also read more feedback from the Norwegian group. Around 4% of journeys in Norway as a whole are made by bicycle. Youtube videos reveal many of the same problems for cyclists in Oslo as in many other cities around the world. Click for more stories about school travel in the Netherlands. This month's Vogelvrije Fietser (the magazine of the Fietsersbond) included an article (which you can download or read here) entitled "The Bicycle reigns in Amsterdam". It's an interesting read. Amsterdam has long been known internationally as a cycling city. Many cities overseas have compared themselves to Amsterdam, often rather inappropriately. However, Amsterdam is a moving target. The city has not been standing still. Very few other places can claim to have seen cycling grow as it has over the last over the last 20 years in Amsterdam. Within the inner ring road, this increase was from 39% to 62% of journeys by bike. As ever in the Netherlands, these figures are claimed to be not just for commuters, but for all journeys. Cycling to railway stations has seen particularly spectacular growth. Just 6% of train passengers arrived at the station by bike at the end of the 1980s, while 40% of train passengers arrive at the station by bike now. The most popular reason for cycling is that it is fast. 50% of those who were asked in a survey, gave speed as their reason to cycle while just 6% said they cycle because it is inexpensive. 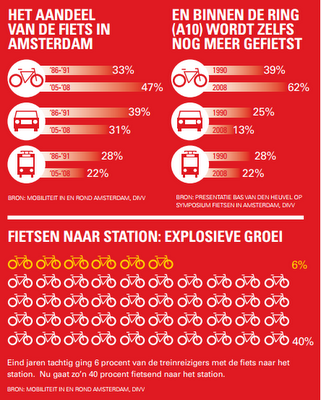 Just 73% of Amsterdammers own a bicycle, while 88% of people in the whole country have (at least) one. 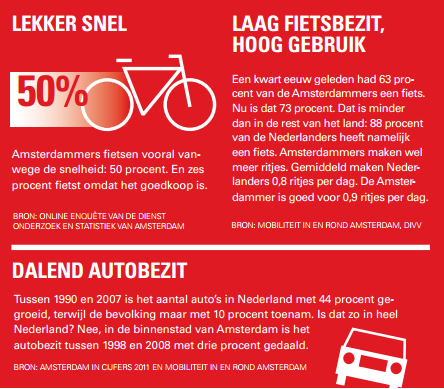 However, the average number of journeys per day by bike by Amsterdammers is, at 0.9 cycle journeys per day, a little higher than the average for the entire country. While car ownership has increased across the Netherlands as a whole since 1990, the number of cars owned in Amsterdam has dropped by three percent and their usage has dropped even more. The modal share for cars has dropped from 39% to 31% of journeys, and just 13% within the inner ring road, a reduction in the number of journeys made by car of 133000 each day. Amsterdam is not perfect. The city doesn't have so high a rate of cycling as many other cities in the Netherlands, in Amsterdam there is still quite a lot of outdated and less than excellent infrastructure, resulting in conflict which has led to complaints between groups of cyclists. It's a place where you need to take more care than in some other parts of the country. The city also has the lowest rate of child cycling in the Netherlands. For all that is wrong with Amsterdam, visiting the city by bike is not like visiting the capital cities of other countries. For cycling, it's in advance of anywhere except other Dutch cities, and as these recent figures show, the feeling of improvement that I have had after recent visits is not just an illusion as there has been real growth since we first took a trip to the city in the early 1990s. It certainly looks better now for cycling than it did in the 1970s. Mark Treasure pointed out in a comment that the rise comes in large part due to walking having been missed out from these modal shares. He's right. Both the Fietsersbond and myself fell into a trap with these figures as they don't reflect the whole picture. I worked out in a comment below that if walking remains the mode for 20% of journeys in Amsterdam then the true modal share for bikes today is about 38% vs. driving at 25% and public transport at 18%. This recalculation leaves Amsterdam with a higher than average modal share for cycling compared with the rest of the Netherlands, but lower than quite a few other smaller cities. This is much as you might expect as there are greater challenges in a larger, busier city. It's rather disappointing to find that Amsterdam is playing games like this with statistics. Without reliable figures no real comparisons can be made. I prefer real statistics to marketing inspired exaggeration, wherever it comes from. Amsterdam has unfortunately continued to make claims of high cycling modal share based in part on ignoring the high number of pedestrians in the city. The real figures are impressive enough. Please return to reporting these real figures instead of marketing the city based on a deception. For more information, please read the Fietsersbond article for yourself, or you may be interested in some of the many other posts on this blog about Amsterdam. Winter. How did we cope ? How did you cope ? We had quite a mild winter this year right up to the start of February when we had quite a cold snap. As is usual in the Netherlands, the plans for sweeping and gritting were followed, and as usual the GPS controller gritters (drivers follow a route but salt comes out only when they're in the right place to avoid waste) did a very good job. Cycling wasn't much affected by the weather. Quite a snow-storm today. It left about 10 cm / 4 inches of snow. Snow storms are of course no reason not to take children by bike. Due to the freshly fallen snow it's difficult to tell, but this is a cycle-path separate from the road. You can see in this photo that the cycle-path has been swept already. However, more snow has fallen since then. It's no problem to ride through soft snow like this but it must be moved before it is compacted. Some of the temperatures around this date in February were very low. The lowest temperatures where we live were about -19 C, which according to the weather websites "felt like" -22 C. Temperatures weren't very much higher than this when people rode to work. We live where it says -18.6 C. That's about -2 F. Due to wind chill, it felt like -22 C ( -8 F ). This does not stop people from cycling. This is the cycle-path which featured in yesterday's photos. After the snow stopped falling it was swept of snow and treated for ice. Bicycle Road towards the centre of Assen. The canal is frozen solid, but cycling is no problem at all. Lots of people cycling in the centre of the city going about their business as usual. The surface is wet due to the action of the salt but it is not slippery. All the routes in and out of the city by bike and by car were clear of snow and ice. Early evening on the edge of Assen, cycle-paths continue to provide safe passage for cyclists, wherever they're riding to. In this case the route is to the furthest suburb which is still part of the city. The temperature was -11 C, but the cycle-paths were clear. I went out for a ride early this morning. Robert and I not only rode next to the canal, but also on the canal. I made a video which shows this beautiful day. We covered a long distance, mainly on cycle-paths as clear of ice and snow as this. Another really beautiful day today, and again a very cold day. The lakes were frozen and covered in skaters. By now there was real hope that the Elfstedentocht (a 200 km ice-skating race/tour on canals between 11 cities) might take place. It was -13 C ("feels like" -17 C) this morning when I set off to ride on almost entirely clean cycle-paths to the Paterswoldsemeer lake just south of Groningen. Frozen lakes are not just for skaters. I made a video of riding on this too. The cycle-paths were of course almost all like this. People started skating a lot. A friend of one of our daughters was one of those who skated to school. She lives in a village called Smilde, 10 km South of Assen. Normally, like all older children in that village, she cycles this distance to get to school. A pleasant place to skate in the afternoon. A lot of school children had taken skates with them to school so that they could skate with their friends before riding home. I've made videos from this hill before, showing typical morning traffic patterns, and why very few cars are ever seen here. The Bruggentocht took place today - this is an ice-skating touring event with distances of between 10 and 60 km which goes through Assen. Over 2000 people took part. Also, a few km west of here, quite a lot of people skated the Elfstedentocht route (unofficially). We went shopping for ice-skates in the hope of at least trying to do a bit of skating (I've never learnt) but couldn't find any to fit. It's warmed up through the week and was -5 C this morning. I went out again for my usual morning ride. Other people go to church on Sunday mornings, and I decided to take photos of the bikes parked by a couple of those churches. You'll notice that the snow looks a bit thinner in these photos. This didn't happen because it thawed but because the air was very dry and so the snow was evaporating into the air. Despite the cold weather, wet clothes hung outdoors dried quite rapidly this week. Part of the route of my morning ride today. This rural cycle-path clear of snow and ice was not an exception but the norm. I made a video here a couple of years ago showing the contrast between summer and winter and why cycle-paths likethis are kept clear in winter. This rural church was also on my route this morning and there was a smaller crowd of bikes (too spread out to fit in one photo) here too. Clearing of ice and snow doesn't stop at the edge of the city. In early afternoon there was a small shower of snow. We waited for it to finish before taking our dog for a walk and almost immediately saw this vehicle clearing a cycle path a couple of hundred metres from our home in the suburbs. Because it is less wide than the four metre width of the cycle-path, more than one run is required. This is the cycle-path that the vehicle above had just come along. The temperature has now been above freezing for more than a week. All dreams of the Elfstedentocht happening this year have unfortunately been crushed. How was winter for you ? How was winter where you live ? Were cycle-paths kept clear so that cyclists could use them ? It is all too common in the UK that excuses are given and promises made after winter, but that nothing actually changes for the next winter. Did this happen to you ? The main railway station of Colchester in the UK serves 11,500 people daily. 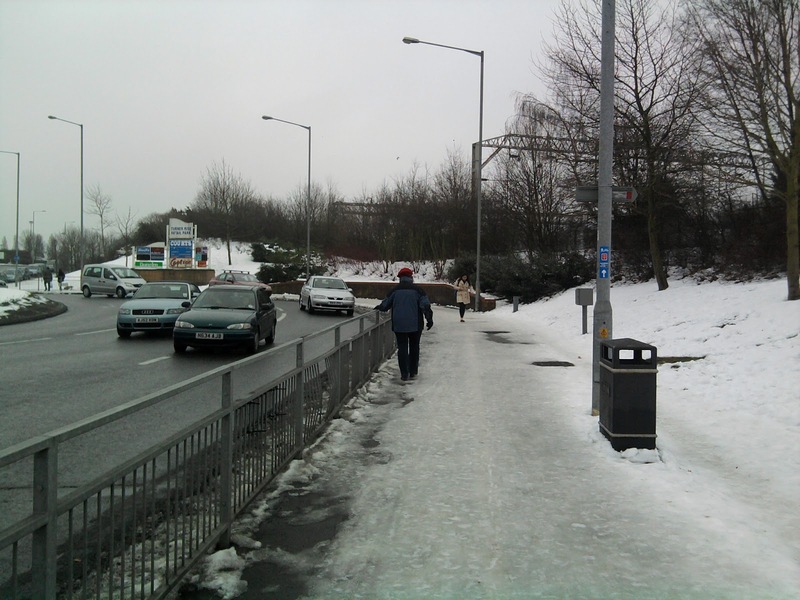 300 m from the station, the road was clear, but the shared use cycle / pedestrian path stayed icy. If you wish to "name and shame" your local council in the UK, or elsewhere, please send a link to a photo and a suggested caption in the comments and I'll add them to this blog post. Prepare for next winter ! We still have stock of Marathon Winter studded tyres. 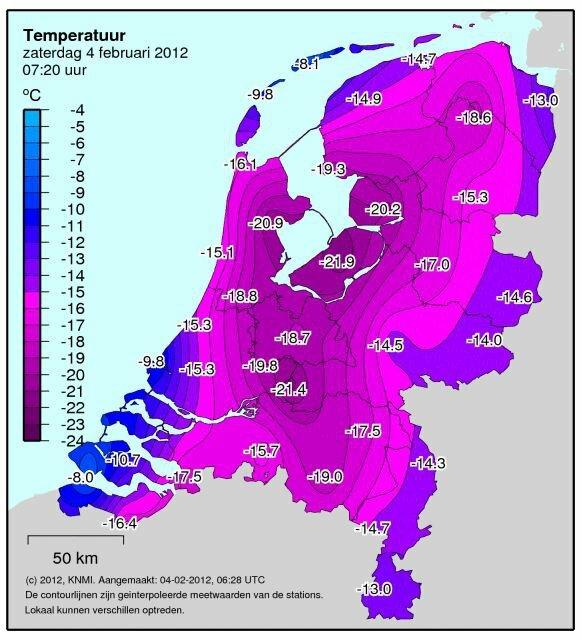 Unfortunately for us, the Dutch mostly don't need them, and with a mild winter like this they need them even less. However, if you live somewhere which isn't treated for ice so well as Assen is, you perhaps wish you'd had them this winter. Until the end of this month, we have a very good discount on these tyres. Stock up now and be prepared for next winter. Who do we campaign for ? Road sign in Assen designed by child. Three years ago, I posed the rhetorical question "Do the British love their children too?" This week, I received an answer in the form of a note which said "For my children in Bristol. Thank you for your work." In the 1970s, the Dutch reacted to increased danger on the streets by calling for change to make their children safer while preserving their ability to make independent journeys. In other nations, children have in large part been removed from the streets. They no longer make journeys in an independent manner. For instance, in Britain, newspapers report such things as that a teenage boy can't make a journey of 11 km on his own while in the Netherlands this sort of distance, and much longer distances, are quite routinely ridden by many teenagers every day to get to school, even in winter. A retrospective glance shows that the Dutch did something extraordinary in the 1970s. With mass support, the future of the country was changed. If this had not happened then the Netherlands could be a very different place now. This was pure luck. The Dutch care for their children, of course, but they do not care for them any more than parents in other nations do. What happened in the Netherlands was that the right people supported the right campaign at the right time. With the right support for the right campaign, similar things could just as easily happen in other countries. The power and compassion of parents is significant. Cycling campaigners sometimes scoff at ill-conceived "safety" campaigns to force children to wear fluorescent clothing and helmets, however such safety campaigns represent a lot of passion. They come from parents who are not happy with the conditions under which their children live. Change is wanted, and these parents are active in fighting for it. The effort is often misdirected into ineffective campaigns, and far too much seems to benefit the producers of fluorescent clothing and helmets rather than actually changing things. Meanwhile, the rate of walking and cycling amongst children continues to drop in the UK. If this energy could be redirected into a campaign to really make conditions on the streets better, then the UK, and other nations, could very easily achieve what the Dutch have achieved, and quite possibly much more. By including parents and children in a campaign, it can achieve mass support which goes well beyond a campaign focussed on "cyclists". Unfortunately, many adult cycling campaigners continue to treat child cyclists as something different to themselves. It has become common in the UK to call for a two speed approach with a double network. Campaigners want on-road facilities for themselves (the "fast cyclists") while also asking for off-road infrastructure to cater for "slow cyclists". This approach is wrong. For a start, it loses the support of many people because it sounds rather like "cyclists" are greedy. It sounds like a request from a greedy person who wants both to have their cake and also to eat it. However, its the biggest problem is that it is doomed to failure by the low expectations embedded right into the demands being made: Off-road infrastructure is expected to be inconvenient for experienced cyclists, while on-road infrastructure is expected to be unsafe for the inexperienced. There is no logic behind this strange dichotomous approach. Infrastructure which isn't convenient enough for experienced "fast" cyclists also isn't convenient for "slow" cyclists. Infrastructure which isn't safe enough for inexperienced cyclists also isn't pleasant for the experienced. The two speed approach introduces a divide between two groups of people who need not be divided. It gives no clear route for progression from one set of infrastructure to the other, nor a clear reason why there should be a progression and it helps to keep "cyclists" as an out-group separated from the rest of society. It is possible to design infrastructure which works equally well for everyone. That is the gold standard. It is what the Dutch did and this blog is filled with examples (see links on the right). Don't ask for less. For real progress in cycling, campaigners need to start to "think of the children". However, children should be thought of not as small people to be condescending towards, but as the rightful heirs of our future transport network. Today's child cyclists are tomorrow's adult cyclists. It is by working with today's concerned parents, by understanding that their concerns are valid and need to be addressed, that tomorrow's adult and child cyclists will best be catered for. Not only do other countries have a chance of improving conditions for cyclists, but by the same means they could also improve their own positions in the UNICEF index of child well-being. Is this not something that every country should aspire to ? There is no need to reinvent the wheel. Whatever problems may appear to stand in the way, the Dutch forty year head-start which should always serve as a reference. The note which prompted this post was attached to a donation which we were sent by a blog reader who is a concerned parent from Bristol. Bristol is Britain's first Cycling City. It received extra funding for a short period of time, at nowhere near the level of Dutch funding. There was much speculation about how the money was spent, and the programme unfortunately failed to meet its targets. To this day, Bristol is still failing to provide safe conditions for child, and adult, cyclists. What happened in the Netherlands in the 1970s was almost unique, but similar things did also occur in Denmark. In the last few months, we've seen a number of developments in cycle campaigning in the UK. The Times newspaper achieved a huge amount of publicity for their "Cities safe for Cycling" campaign. This came about as a result of one of their reporters being seriously injured. However, while their campaign is no doubt genuine, it is unfortunately also the result of rather too little research. The result of this is that they set the bar for quality extremely low. The London Cycling Campaign also launched a huge publicity drive with their "Go Dutch" theme. However, they did not understand what has actually been achieved in the Netherlands, and they also have set the bar too low, trying to "Go Dutch" by calling for infrastructure designs which fall well below the standards of the Netherlands. Two high profile campaigns running simultaneously, both ignorant of what is required. They provide a considerable challenge to cycling campaigners who want to see real change occur in the UK. However, all is not lost. Last September, was the date of the launch of the Cycling Embassy of Great Britain. This is the group to join and support if you are interested in real change in the environment for cyclists in Britain, and in cycling growing to have a modal share similar to that of the Netherlands. In the CEoGB, a relatively small number of people, with a relatively small budget, are working for what really works without being dragged down by the baggage of vehicular cycling orthodoxy. Because it is important to support the CEoGB we have added a link to the right hand side of this blog which leads to their website. How much is too little ? When organisations ask for inadequate action, they are not really helping cyclists, no matter how much publicity results. The Times' asked for a total of £100 million to be spent on cycling each year in England. This sounds impressive but has actually set back campaigning for several years. They are asking for just £1.94 per person per year. While this is a higher rate of funding for cycling than in present day England, it's not really an advance but a return to the same level of funding that we were complaining about in 2005 ! In 2006, I wrote an introduction for an article which included my calculation that expenditure in Cambridgeshire in 2005 was at a rate of approximately £1.45 per person per year. Add 7 years of inflation at just over 4% and you get exactly the figure that The Times is asking for now as an aspiration. To create the "world class infrastructure" that many talk about is simply not possible for such a low figure. It also won't happen for the "£10-20 per person per year" as commonly called for by cycling campaigners who are unaware of the true level of Dutch cycling investment. Actually, the Netherlands spends about £25 per year per person (actually €30, roughly equivalent to $38). For the UK this would amount to a total of not £100M, but nearly £2B per year, every year, to be spent on cycling infrastructure. The USA would have to spend over $11B on cycling each year to match this. This is not an insignificant sum and many campaigners shy away from mentioning this amount of money. However, it must be born in mind that this is not the price of gold-plating and doing more than is necessary, it's merely the price of the "world class infrastructure" needed to achieve the world class modal share and world class levels of safety which the Netherlands has now. Every country which spends less on cycling achieves less cycling (that includes the noisy self promoters North from here). What's more, it's not an upper limit. In future, to achieve a higher modal share and better safety, this figure will have to increase. This should be kept in mind by all campaigners when negotiating. Compromises may sometimes have to be made, but don't make them before negotiation starts. You should not be asking for the least progress possible but the greatest progress possible. Starting out by calling for a 20th of what you want is not a strategy for success. As I explained a few posts back, this is akin to Rosa Parks having asked merely for the signs on the bus to be in a fixed position. Of course, many people will say that you can't ask for this amount of money as the country can't afford it. However, this is not true. Britain is not really poor, it just prioritizes its expenditure a little differently from some other places. For instance, the Royal Navy recently ordered two new aircraft carriers. These "supercarriers", ordered in a time supposedly of peace, will be by far the largest and most expensive ships that the Royal Navy has ever had at its disposal. The reasons why the UK "needs" these carriers are quite bizarre. The First Sea Lord, Sir Alan West, said "I have talked with the CNO (Chief of Naval Operations) in America. He is very keen for us to get these because he sees us slotting in with his carrier groups. For example, in Afghanistan last year they had to call on the French to bail them out with their carrier. He really wants us to have these, but he wants us to have same sort of clout as one of their carriers, which is this figure at 36. He would find that very useful, and really we would mix and match with that." Yes, Britain is actually ordering these ships because the Americans want them to. And what will this vanity project cost ? Originally the price was set at £3.5 billion apiece, but that increased to 6.2 billion and is now expected to reach £12 billion per ship before they are finished. What's more, because the country has completely lost control of this project and won't have any aircraft to put on the carriers when they are launched, it is now expected that the first ship will be mothballed immediately after launch in 2016. This is just one example out of a long series of failed military projects. Another example memorable to me was of spending billions on failing to make a warmed over version of the same 1950s airliner, not just once but twice. Such wasted money easily dwarfs the cost of the world's best cycling infrastructure. Can't we have both ? Actually the military doesn't really have to stop wasting money in order that Britain can afford to invest in cycling. The Dutch have repeatedly shown that even relatively sparsely used rural long distance cycle-paths are cheaper to build than not to build. What's more, cycling has been shown again and again to have many positive effects both in society and even for business. If Britain could achieve the same cycling to work rate as the Netherlands, this would save British businesses more money than it costs to outspend the Dutch on cycling. Quite apart from all the wasted lives, resources and political good-will, we now know that the monetary cost of the failed wars in Iraq and Afghanistan was enough to fund cycling at Dutch levels for at least 25 years. Well managed, that could have been enough to catch up with the Netherlands. There are now several more posts about the confusion which arises when people attempt to "Go Dutch" without really understanding what has been achieved in the Netherlands. The calculation for Cambridgeshire in 2005 was for cycling and walking combined, based on figures provided by the same Julian Huppert as now supports The Times' campaign. To be fair, he has called this time fora bit more to be spent than The Times asked for, though it's still less than is required to match the Netherlands. Copyright and licensing of "A View from the Cycle-Path"
We provide the content of this blog as a service to our readers. It is free to access, but copyright remains with the authors. Our content falls under international copyright law. This happens automatically for any writings or other creative content and we have never waived any of our rights under these laws. Many people have used our content, but they have almost always done so within the spirit of how we made our material available. We want people to be able to comment on what we do, and to build on what we do. This is what blogging is about. Recent events have made it necessary for us to make clear where the lines of what we consider to be reasonable use lie. We have taken the decision to formally waive our rights in some cases but to retain our rights in other cases, as explained below. Students and researchers: If you wish to use our material as part of research or in essays then you may quote small sections of text and use small numbers of photos, but you must attribute the source. Such quoting of part of our articles must be in accordance with the Creative Commons Attribution-NonCommercial-ShareAlike 3.0 license. Please do not copy entire blog posts. Individual not-for-profit bloggers: Individuals who have their own non commercial blog may quote sections of our text or use small numbers of photos. For these purposes you can consider our work to be licensed in accordance with the same Creative Commons license as above. Always include a link to the source. Please do not copy entire blog posts. Individual blogs with a small income: We define people who run a blog which achieves a small amount of income, up to €500 per year, through advertisements or selling small quantities of goods as "NonCommercial". You can use our material with the same rights as people who do not make any profit from their blogs, always including a link to the source. Please do not copy entire blog posts. Small to medium sized campaigning groups: Non-commercial campaigning organisations which have a small income through subscriptions and selling of small quantities of goods, which do not have paid staff and which have a membership no larger than the Cambridge Cycling Campaign (at the time of writing, approximately 1100) may also consider themselves to be "NonCommercial" and therefore make use of individual photos or quotes from our material on their websites and printed newsletters - with attribution. In some circumstances, you may wish to copy entire blog posts for your printed newsletter. Please contact us for permission. Internal use by small to medium sized campaigning groups: Sometimes, campaigning organisations like to use our photos or text as part of presentations made to local government or other officials. This is encouraged, but please always include attribution to the source. Blogs which belong to small bike shops. If you own your own bicycle shop with one location and also write a blog about cycling then you are in most cases free to quote from our text and use individual photos on your blog under the same conditions as the other examples above. Always include attribution in the form of a link to the source. Do not copy entire blog posts and do not use our photos or text overtly to sell your goods. Please note that in all the above cases we have written about quoting small sections of our material. We are interested in seeing other people create their own new content which quotes from ours, but we do not wish to see wholesale copying of our content. If you feel you have are in one of the above categories and have good reason to want to copy a whole article then please ask for permission. We will almost certainly say yes. Large campaigning groups: We define "large" as any campaigning organisation which has sufficient income to pay staff salaries or which has a membership over 1100. In these cases, campaign groups should expect that under most circumstances they should pay for content. For purposes of comment, we allow "quoting" of a very small amount of text or occasional photos with attribution in the form of a link on the website or written on printed copies under the same terms as above. If like one of our articles enough that you would like to reproduce it, contact us for our rates. Newspapers, magazines, commercial websites, TV channels: Newspapers and magazines should expect to pay for their use of photos or text. For purposes of reference or criticism you may quote very small sections of text with attribution in the form of a link on your website or written on printed copies. If like one of our articles enough that you would like to reproduce it, contact us for our rates. Government or internationally funded agencies: Any organisation which is funded by government to promote cycling or for any other purpose can quote small parts of our text for reason of reference or criticism, with attribution. They should contact us before using our material for any other purpose. We have worked for government agencies in the past and we are available to do more of this in the future. Companies: Any company run for private profit including but not limited to architects, building companies, bicycle manufacturers and bicycle shops should contact us for licence conditions. If you think you rightly belong in the "small bike shops" category, please explain why. Otherwise, please contact us for permission and pricing. Advertising: If you want to use one of our photos for advertising, please contact us to ask for pricing. Internal usage: If you wish to use our materials within your organisation, for training purposes or for internal presentations, but not on your website or in print, you should still ask for permission. This is use of the material that we produced, none of which has been placed into the public domain. We may be able to help you with training. We have many videos on our youtube channel. Youtube makes it easy to embed these on your website or blog. We do not attempt to limit embedding of our videos and do not make any charge for doing so. However, if you wish to download our content from youtube and re-upload it either as-is or edited to another video server, or you wish to download the video and use it as part of a presentation or other work, please ask for permission. This blog came into existence to help people who had been on our Study Tours to stay up to date with developments in the Netherlands. Through the blog you see only a glimpse of what is possible. The blog is not a substitute for the Study Tour. Relying on online content such as blogs, videos and Google Maps to view the nation from afar will only ever give a partial understanding of what has made the Netherlands the worlds' leading cycling nation. This can lead to emphasis on the wrong things a lack of progress on cycling. The differences between countries where few people cycle, like the UK, and the Netherlands, are not so easy to understand as they may at first seem. We have a unique view which comes from having lived and cycled in both the UK and the Netherlands. It took us many years to gain our experience, and this is what we pass on in three days of Study Tour. For licensing of existing material, to commission new material, to book a Study Tour or to book us as consultants, please contact us through our website. Almost all the content on this blog was created by the authors. However, for the purpose of being able to make comment on what is happening elsewhere we have also occasionally used other people's material as a part of our blog posts. In some cases, these other items are in the public domain, or licensed in such a way that they are free to use. In other cases we have quoted from other publications, government agencies and blogs. In all these cases, we have sought to apply the same standards as we expect others to apply. Links to the source are provided. If you believe that we have used your content in a way to which you object, please contact us and we will remove or re-label the offending item. Our licensing terms do not apply to text or photos which originate elsewhere.